I can almost feel the excitement that the researchers of the Nautilus Exploration Program must have felt when their robotic explorer met this glorious sperm whale at 598 meters (or 1,962 ft) below the Gulf of Mexico off the coast of Louisiana. The whale circled Hercules several times and gave our cameras the chance to capture some incredible footage of this beautiful creature. 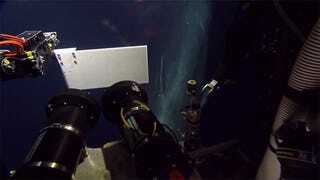 Encounters between sperm whales and ROVs are incredibly rare. The robot called Hercules is a Remotely Operated Vehicle (ROV) designed for ocean explorers, and well suited to study archeology, biology and geology and more in the deep sea down to depths of 4,000 meters (2.5 miles).